Give divers the option of exploring a sandy bottom or a reef and the near unanimous choice will be a reef. In fact, both day and night divers often appear to swim over patches of sand as if they are trying to escape from something. But if you always choose reef over sand, you will miss out on a lot of fascinating creatures and behaviors. This is especially true in many destinations in the Coral Triangle, the Indo-Pacific region that is roughly bounded by the Philippines, Malaysia, northern Australia, Papua New Guinea and the Solomon Islands. This incredibly rich region is the center of marine biodiversity and night dives in the sand biome routinely produce some of the highlights of diving expeditions. If you always choose reef over sand, you will miss out on a lot of fascinating creatures and behaviors. Here we’ll examine the natural history of a few creatures that divers might encounter when night diving in the Coral Triangle. If there are more bizarre looking and beautiful marine animals than nudibranchs, most divers have yet to see them. The body colors of “nudis” are essentially reflections of the sponges, algae and cnidarians they consume. Worldwide, there are more than 3,000 species of these shell-less mollusks and few, if any, pack more “wow factor” than the Spanish dancer, Hexabranchus sanguineus. The word nudibranch is derived from the Greek meaning “naked gills.” The common name is a reference to their shell-less, or naked, bodies and uncovered (thus naked) gills that are attached to and extend from the outside of the bodies in many species. Described in the subclass Opisthobranchia (opistibranchs), a grouping that includes other shell-less snails in the class Gastropoda (gastropods), nudibranchs exhibit an evolutionary trend towards the reduction, internalization and complete loss of the external shells found in many other mollusks. As adults, most species are bottom dwellers that occur in reef communities in tropical and temperate seas around the world. The smallest species grow to less than one-half inch (1.27 cm) long while one of the larger, the Spanish dancer, is commonly 18 to 24 inches long (46 to 61 cm). The bodies of most Spanish dancers are speckled hues of orange and red with numerous white dots, but the bodies of others are uniformly deep red. 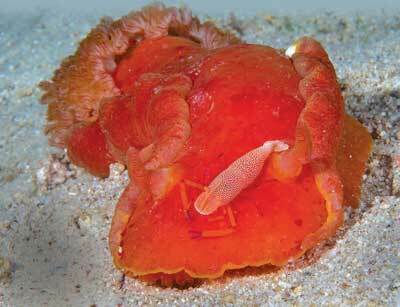 An Indo-Pacific species, the Spanish dancer is a type of dorid nudibranch. Dorids comprise one of four suborders of nudibranchs. The general body shape of the members in each suborder is significantly different than those described in the other suborders and the same is true of their food preferences. 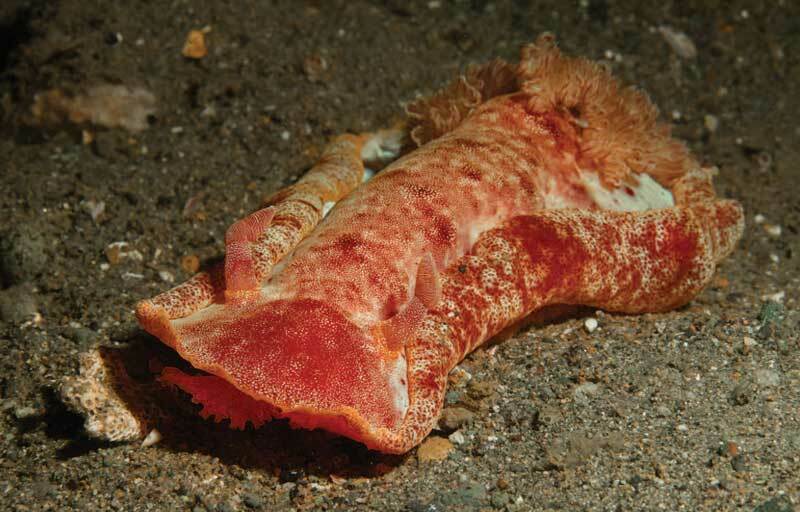 Typical of dorids, the Spanish dancer has a body that is generally oval and flattened. Two sets of projecting structures extend upward from their backs. The structures located toward the front of the body are called rhinophores while the ruffled structures near the back are the gills. Rhinophores are chemosensory antennae that allow dorids to detect one another and their prey. The Spanish dancer can swim to escape prey or change locations. In fact, it gets its common name from its rhythmic, undulating movements which resemble that of a Spanish Flamenco dancer’s twirling skirt. A close examination of a Spanish dancer often reveals one, and sometimes two, colorful emperor shrimp residing on their host. The majority of dorids prey upon a variety of sponges. Spanish dancers ingest some of the foul toxins contained in the bodies of the sponges they prey upon and they are able to use those toxins for their own defense. The bodies of most of Spanish dancers are speckled hues of orange and red with numerous white dots, but the bodies of others are uniformly deep red. These marine jewels tend to seek cover in the cracks and crevices reefs during the day and emerge at night to feed where they are often seen making their way across the sand. A close examination of a Spanish dancer often reveals one, and sometimes two, colorful emperor shrimp (Periclemenes imperator) residing on their host. While each species can survive without the other, when together, they enjoy a mutually beneficial relationship. The shrimp benefit by gaining access to food and from the protection provided by Spanish dancers that are distasteful to potential predators. The nudibranch benefits when the shrimp remove parasites from the nudibranch’s skin. An emperor shrimp also gains access to food by positioning itself on the edge of the nudibranch’s body and, as the mollusk makes its way across the bottom, the shrimp has a continuous opportunity to find food particles, mostly algae and detritus, on the sea floor. The anemone hermit crab gets its name from its habit of adorning its shell with anemones. While most sea anemones live the majority of their lives attached to the substrate, there are times when night divers encounter anemones that appear to be racing across the sandy sea floor. A closer examination reveals that the anemone is attached to the discarded shell of a snail or other gastropod mollusk that is inhabited by a highly mobile anemone hermit crab. Hermit crabs are one of the two main groups of crabs: the other being true crabs. 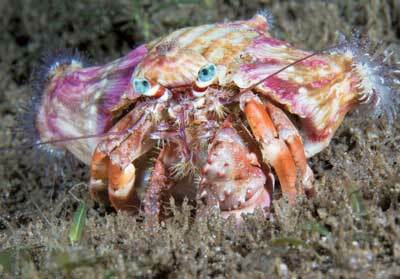 Most hermit crabs inhabit the marine realm but others live a predominantly terrestrial existence. Hermit crabs differ from true crabs in that their abdominal section, the part of the body that includes the tail, is not protected by a hard exoskeleton. To deal with this vulnerability, hermit crabs inhabit the discarded shells of snails and other gastropod mollusks. Most hermit crabs have bodies that are only one inch (2.54 cm) or so across, but there are some species that are considerably larger having bodies that are close to 12 inches (30 cm) long. In order to grow, hermit crabs must discard their non-growing, protective exoskeleton and form a new one in a process known as molting. With each molt, hermit crabs outgrow the shells they inhabit. During the molting process hermit crabs are vulnerable to predators, yet it is only when molting that females can mate. After molting, hermit crabs quickly begin to search for a new, larger shell that will accommodate their larger bodies. These crustaceans often appear to be obsessive about finding new shells even if the shell they currently inhabit is perfectly suited for them. They often change shells when they come across one that they find more appealing. In fact, shell trading between hermits that randomly cross paths is a common affair. Hermit crabs are equipped with a pair of claws, one on each of the front legs, which are located on each side of the body. The claws are used for defense, grasping objects and food and to crush food and place it in their mouths. In many species one claw is considerably larger than the other. 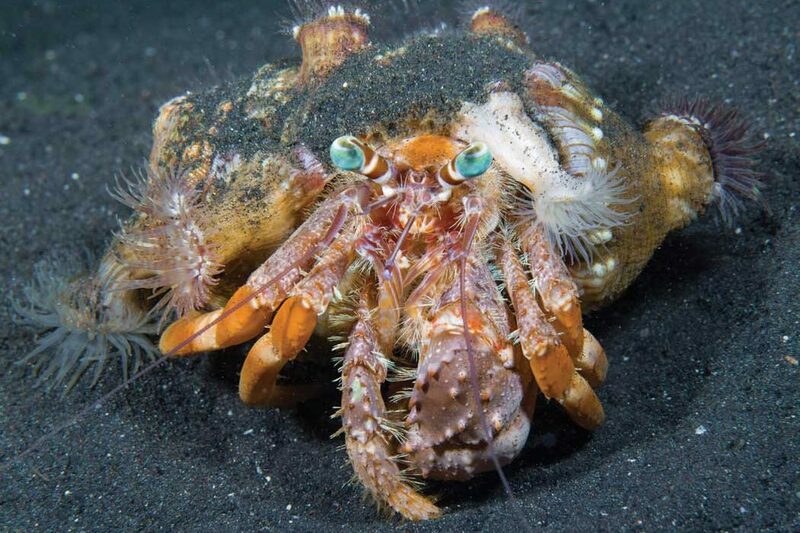 The Indo-Pacific hermit crab, Dardanus pedunculatus, shares an intimate relationship with sea anemones and is commonly known as the anemone hermit crab. 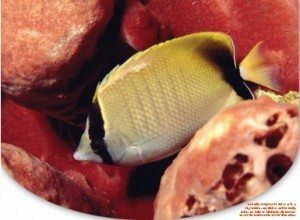 This common name is also given to two other closely related species found in the Red Sea and Great Barrier Reef. When young, anemone hermit crabs grab one, or more, small anemones with their claws and place the anemone(s) on their shell. The anemones use their foot-like basal disc to attach themselves to the shell and with those acts completed, the members of two species become partners for life. When an anemone hermit crab changes shells, it will take the anemone with it. The relationship benefits both the anemone hermit crab and the anemone with neither being harmed. The hermit crab gains protection from potential predators from both the camouflage provided by the anemone and the presence of potent stinging cells in the anemone’s tentacles. The anemone benefits by gaining access to bits of food the hermit crab leaves behind when it feeds, as well as, from added access to food such as plankton and small fishes as the hermit crab travels across the sea floor. 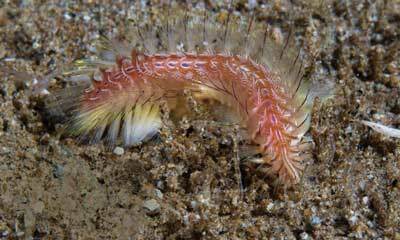 The bristle worm’s stiff, sharp bristles provide significant protection against potential predators. In stark contrast to many common terrestrial worms, marine worms often display eye-catching colors. But the beauty of the species known as bristle worms belies their potency, a fact referenced in their common name, fire worm. The brightly colored bodies of bristle worms are covered with fiberglass-like, calciferous spines or bristles called setae. The stiff, sharp bristles provide significant protection against potential predators and they can easily penetrate the skin and gloves of divers. The spines do not contain venom, but they can cause a very intense burning sensation. The brightly colored bodies of bristle worms are covered with fiberglass-like, calciferous spines or bristles, called setae. Bristle worms typically reach lengths of two to twelve inches (5 to 30 cm). Ranging from dull tan or brown to vivid hues of red, orange, pink and green, they occur in a wide variety of colors. In many Indo-Pacific destinations, the highly carnivorous bristle worms occur in varied marine ecosystems, with some species being commonly seen on night dives in areas where the sea floor is predominantly sand. While laymen tend to think of all animals referred to by the common name “worm” as being very closely related, taxonomists classify these animals in several phyla. In fact, the fundamental differences in the group of animals known as marine worms are so significant that taxonomists describe them in two phyla. Segmented worms such as bristle, Christmas tree and feather duster worms are described in the phylum Annelida, while flatworms and ribbon worms are placed in the phylum Platyhelminthes. Bristle worms are further described as types of polychaete worms. The word polychaete is derived from the Latin for “bearing many hairs.” Collectively speaking, polychaete worms make up the largest biomass of animals found in many areas where the bottom consists mostly of sand. This fact often comes as a surprise to experienced divers as many bristle and other worms that inhabit the sand biome spend the majority of their lives buried in the sand as opposed to living on top of it. Voracious feeders, bristle worms readily prey upon hydroids, corals—especially a variety of gorgonians—some sea anemones and almost any creatures they can subdue. They are also known to readily scavenge upon dead animals. Like many animals that can be seen crawling on the sand at night, bristle worms are capable of quickly disappearing from sight by burrowing into the sand. Many divers are taken aback the first time they see animals seek shelter or pursue prey in this manner, as it seems like they would injure themselves or suffocate when buried in the sand. But bristle worms are well adapted for this feat and their disappearing act provides protection from potential predators such as rays and other fishes.